These implants are FDA approved for breast augmentation in women 22 years or older and are comprised of 100 percent pure grade silicone. These implants are FDA approved for breast augmentation in women 18 years or older and consist of an outer silicone shell filled with a sterile saltwater solution. Implant placement will impact the final position of your implant. Your ideal implant placement will be determined during your consultation. Implants are placed under the glandular tissue but over the pectoral muscle. This may be the preferred placement for athletic women in order to avoid implant distortion during muscle contraction. Implants are placed under the glandular tissue and pectoral muscles. This can provide more natural-looking fullness in the upper pole of the breasts and can hide implant edges in women with thinner breast tissue. Breast augmentation is commonly combined with a breast lift in women with moderate to severe ptosis of the breasts. Breast augmentation is commonly performed during a Mommy Makeover to restore volume that has been lost during pregnancy. Small breasts may lack the fullness or size that you’ve always wanted. Dr. Dubrow works closely with you to determine your ideal breast size. A number of factors can affect your implant size, and Dr. Dubrow will help you navigate through your options. Providing volume to the breasts should be done to maintain a natural appearance while providing the physique you vertical. Dissatisfaction with breast shape is common in many women who are considering breast augmentation. You may lack attractive cleavage or definition along the breasts. Factors such as implant placement and projection can help you achieve the breast look you want. Improving the shape of the breasts can help them appear less augmented and more realistic. There are two major characteristics that impact your balanced breast appearance. Asymmetrical breasts, if not corrected, can appear off in size and placement. Additionally, it is important to maintain balanced proportions between your bustline, waist, and hips. Achieving breast symmetry and breast-body balance can create a more natural look. I am so satisfied for the FANTASTIC results of the breast augmentation but I am mostly grateful to Dr. Dubrow and his staff for their professionalism and care throughout the entire process. Thank you! Everyone heals at a different pace, and your exact recovery time will vary. In general, you will experience bruising, swelling, and numbness following your surgery. A special surgical bra may be worn throughout your recovery. Most patients are able to return to work a week following their procedure. You should be able to resume your regular exercise routine after three or four weeks. Dr. Dubrow will guide you through your recovery process to ensure the best results possible. It is common to experience some form of pain or discomfort following your surgery. You may develop a tightening of the chest or pressure as your body accommodates your new implants. Oral medication will be prescribed to help alleviate any postoperative pain you may have. Most patients find that their discomfort only lasts the first few days. Discuss any aftercare concerns you may have with Dr. Dubrow during your consultation. What type of anesthesia is used for breast augmentation surgery? Can just a breast augmentation improve sagging? Do breast implants need to be replaced after a certain period of time? Most patients undergo breast augmentation with general anesthesia to ensure patient comfort and safety. Depending on the technique used for your breast augmentation, surgery can take anywhere from one to two hours. No. Breast augmentation alone won’t provide any significant improvement in breast sagging. It is important to treat ptosis at the time of your augmentation to prevent future complications from forming. You will notice an immediate breast size increase following your breast augmentation. However, swelling will impact the overall look of your breasts. Most implants settle into their final location within two months as swelling subsides. Breast implants aren’t considered lifetime devices and may need to be replaced at some point. However, there is no designated time after which they need to be replaced. If you think your implants have ruptured/leaked or you have become unhappy with your breast appearance, schedule a consultation with Dr. Dubrow to evaluate your breast needs. 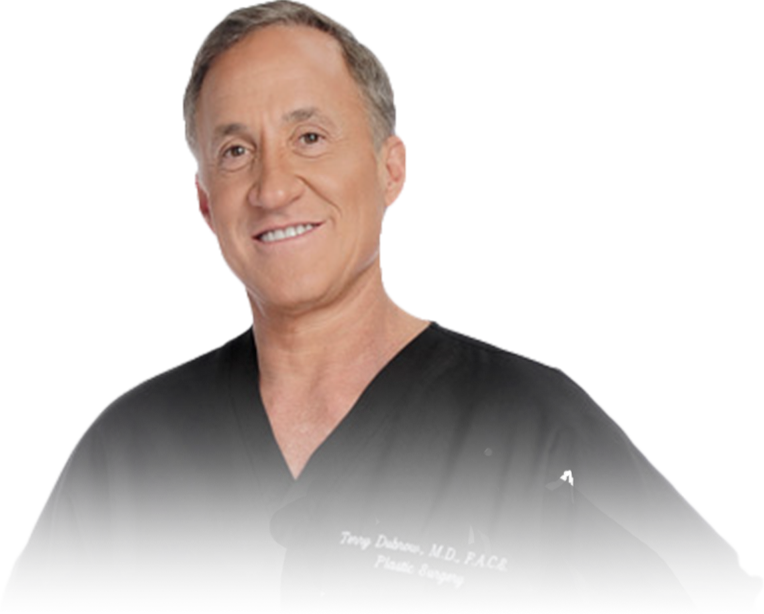 Dr. Terry J. Dubrow, M.D., F.A.C.S.